Ladakh, or 'Little Tibet', is a wildly beautiful desert land up in the Western Himalayas. It is a place of few resources and an extreme climate. Yet for more than a thousand years, it has been home to a thriving culture. Traditions of frugality and cooperation, coupled with an intimate and location-specific knowledge of the environment, enabled the Ladakhis not only to survive, but to prosper. Everyone had enough to eat; families and communities were strong; the status of women was high. Then came 'development'. Now in the modern sector one finds pollution and divisiveness, inflation and unemployment, intolerance and greed. Centuries of ecological balance and social harmony are under threat from pressures of Western consumerism. 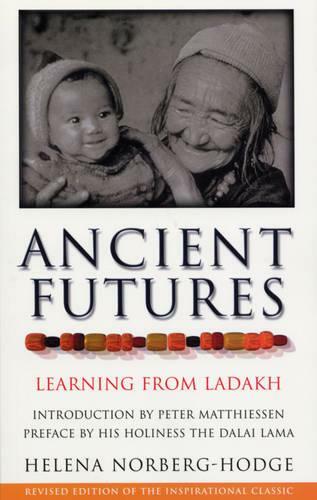 Ancient Futures is much more than a book about Ladakh. Passionately argued, it raises important questions about the whole notion of progress, and explores the root causes of the malaise of industrial society. At the same time, the story of Ladakh serves as a source of inspiration for our own future. It shows us that another way is possible, and points to some of the first steps towards kinder, gentler patterns of living.